The UFC has announced that “The Ultimate Fighter” will return next year, and the current middleweight champion Robert Whittaker will coach the fighters alongside contender Kelvin Gastelum. Whittaker is currently injured with a broken hand after his rematch with Yoel Romero at UFC 225. The selection of Gastelum as TUF coach finalizes that he won the race and is next in line for the middleweight title shot. The former champion, Chris Weidman who has recovered from his thumb surgeries, claimed that he should be given the next title fight against Whittaker as he finished Gastelum in their fight. Whittaker who has an impressive professional record of 20 wins and four losses is currently on an eight-fight win streak. The talented Aussie thwarted the dangerous Yoel Romero twice. The last fight at UFC 225 was a close call split decision. Whittaker was dropped by Romero on a few occasions, yet Robert kept moving forward and got the win in the end. His next opponent Gastelum is also on a two-fight win streak with a knockout victory over Michael Bisping and an impressive split decision victory over Ronaldo “Jacare” Souza. This will be Gastelum’s first shot at the middleweight title. He was considered as a backup for UFC 225 after Yoel Romero missed weight. But, Gastelum had to decline the offer because of weight cutting issues on a short notice. Season 28 of TUF will premiere on Aug. 29. It’ll air on FOX Sports 1. This season will feature heavyweights and female featherweights. 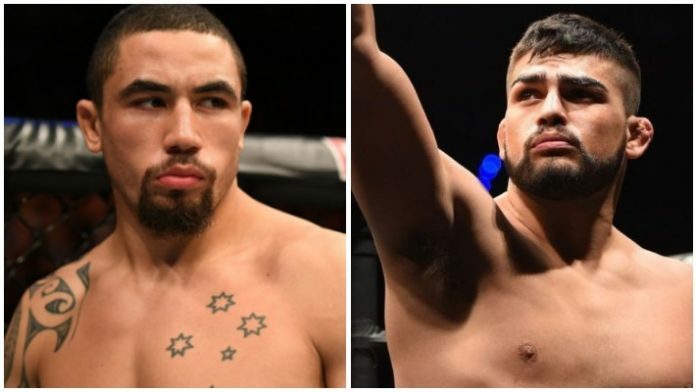 Who do you think wins, Robert Whittaker or Kelvin Gastelum?